Brome 1024 Squirrel Buster Plus Wild Bird Feeder with Cardinal Perch Ring. This posigrip ring system has been specifically designed to attract cardinals. These perennial favorites have two very distinct features: small necks and big feet. They prefer gripping a thicktextured perch and facing their food source directly. Cardinals dislike turning their heads to feed. The Squirrel Buster Plus Cardinal Ring perch system allows them to eat facing the seed while providing a secure and comfortable perch. These cardinal friendly feeding features combined with a bush level location make Squirrel Buster Plus very inviting to cardinals. The seed ports close automatically when a squirrel climbs onto the feeder. Birdwatch America's Best New Product Award. Seed capacity: 3 quarts. Guaranteed squirrel and large bird proof. Detachable Component systemTM Squirrel Buster PlusTM components are designed to be assembled and dismantled easily by hand, without tools, and to fit into your dishwasher. Dishwasher safe Bird FeederTM Clean feeders are as important to wild birds as clean dishes are to humans. Grimy bird feeders can be a source of illness that can be fatal for birds.With squirrel Buster PlusTM detachable components it is effortless to provide the birds you love with a safe and healthy feeder. 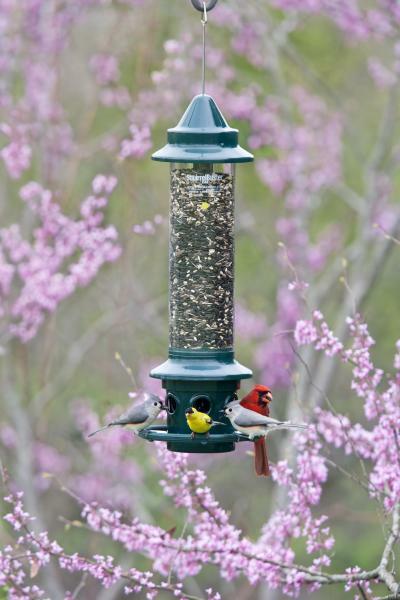 Regular cleaning of your bird feeder is essential and should never be delayed. spread the word about clean, safe feeders. Where do I locate my Squirrel Buster PlusTM? You can locate this bird feeder anywhere and be squirrel free. Position it to get great close-up views of your favorite birds. Hang your squirrel Buster PlusTM over a window, in a tree, on a deck, a fence, in your garden, on the side of your house, from a rain trough or over sliding doors. Use brackets, extension hooks and tree hooks to hang your feeder at the recommended clearance. Hooks and brackets are available at birding stores, garden centers and hardware supply stores. Squirrel Buster PlusTM prevents squirrels from eating expensive seed, scaring the birds and damaging your feeder. Enjoy being free of squirrel problems, but please remember, squirrels also need to eat. For the price of a few peanuts, or inexpensive cracked corn, squirrels will be happy to entertain. 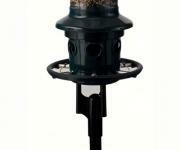 Note:Optional AdapterKit for 1 inch pole and Weather Guard available at checkout. Gives your songbirds shelter! UV protected polycarbonate. Hassle-free lifetime warranty. Fits all 1 inch poles. Comes with a stainless steel mid-ring to thwart squirrels. Guaranteed squirrel proof. Rustproof. Lifetime, hassle-free warranty.